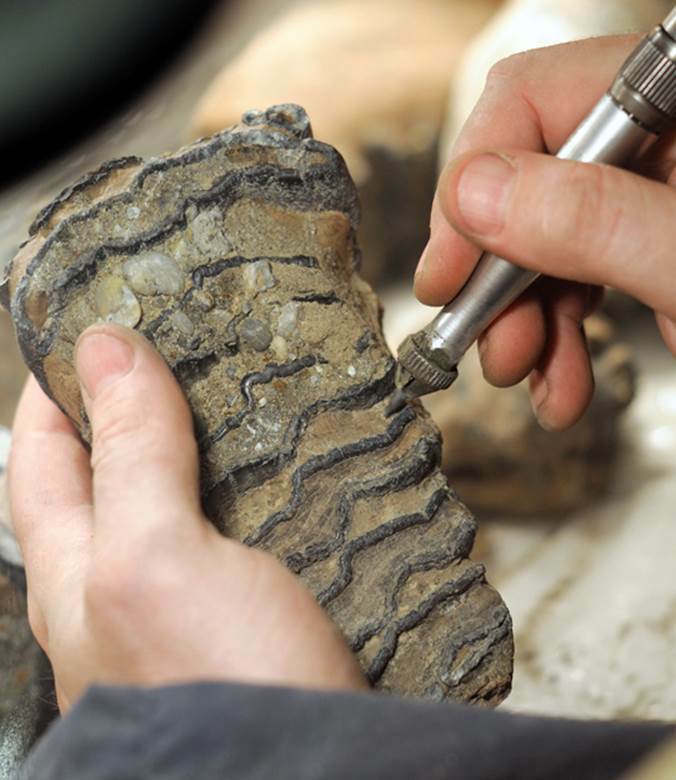 The determination of the absolute age of fossils has been invaluable to biologists as they trace the history of life and the evolution of living organisms. One of the most common techniques for determining these ages is radiometric dating, which is based on the observations of physicists and chemists at the turn of the twentieth century and their studies on the decay of radioisotopes. During the course of his work on uranium salts, in 1896, Henri Becquerel, teacher of Marie Curie, serendipitously found that uranium spontaneously emitted radiation, which led to his discovery of radioactivity. Building upon Becquerel’s findings, Ernest Rutherford, father of nuclear physics, and his student Frederick Soddy, working at McGill University in 1902, found that the process of radioactive decay changes atoms from one element (parent isotope) to another (daughter isotope) at a constant rate. (Isotopes have the same number of protons in their nucleus but a different number of neutrons, giving rise to the same element but with different atomic masses.) Rutherford and Soddy predicted the time it would take for one-half the atoms in an isotope to decay, and this half-life (t½) decay is unique for each isotope. Carbon–14 has a t½ of 5,730 years and has been used in more recent times to determine the age of organic materials, such as wood, bone, shells, and fabrics that are up to 75,000–80,000 years old. By contrast, uranium-238, with a t½ = 4.5 billion years, is used to determine the age of older fossil samples. Bertram Boltwood was a Yale University radiochemist and pioneer in the study of radioisotopes. Initially a correspondent and later a close friend of Rutherford, in 1907 he was the first to apply Rutherford’s principles to what would become radiometric dating. Using the ratio of the half-life decays of uranium-238/lead-206, Boltwood estimated the age of the Earth to be 2.2 billion years, ten times older than had previously been determined, but one-half the present age calculation. SEE ALSO: Origin of Life (c. 4 Billion BCE), Fossil Record and Evolution (1836), Dendrochronology (1904), X-Ray Crystallography (1912), Lucy (1974). An archeologist cleans a mammoth’s tooth. The earliest mammoths appeared about 5 million years ago, but while most became extinct around 10,000 years ago, some dwarf mammoths lived as recently as 4,000 years ago.